Emmanuel D'Astier was born in Paris, France, in 1900. He attended the Naval Academy but left the French Navy in 1924. D'Astier became a successful poet and journalist and for a while became involved in right-wing politics. However, the emergence of Nazi Germany and the Spanish Civil War moved him sharply to the left. On the outbreak of the Second World War D'Astier rejoined the Navy. He was head of naval intelligence but was dismissed after Henri-Philippe Petain signed the armistice with Germany in June, 1940. D'Astier joined a small group of saboteurs based in Lyons in the south of France. 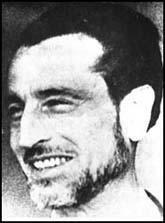 Numbers of resisters grew and he eventually became leader of the left-wing Libération-sud resistance group. The first important French Resistance group to emerge after the German occupation, it began publishing Libération in July 1941. In 1942 D'Astier entered talks with Jean Moulin about the possibility of uniting all the resistance groups working in France. After much discussion Moulin persuaded the eight major resistance groups to form the Conseil National de la Resistance (CNR). This included D'Astier's Liberation-sud as well as Combat (Henry Frenay), Francs-Tireur (Jean-Pierre Lévy) (Francs-Tireur), National Front (Pierre Villon) and Comité d'Action Socialiste (Pierre Brossolette). D'Astier met General Charles De Gaulle in Algiers in 1943 and and agreed to join his government in exile. After the liberation of France De Gaulle appointed D'Astier as his minister of the interior. He also continued to publish the Libération newspaper and wrote several books based on his war experiences. Emmanuel D'Astier, who was awarded in Lenin Peace Prize in 1958, died in Paris on 12th June 1969.